I appreciated receiving the invitation to write on this topic from SEBBM, for which I thank Miguel A. de la Rosa and Angel Herráez. I am not an “expert on education”, nor am I an “expert on internationalization”. 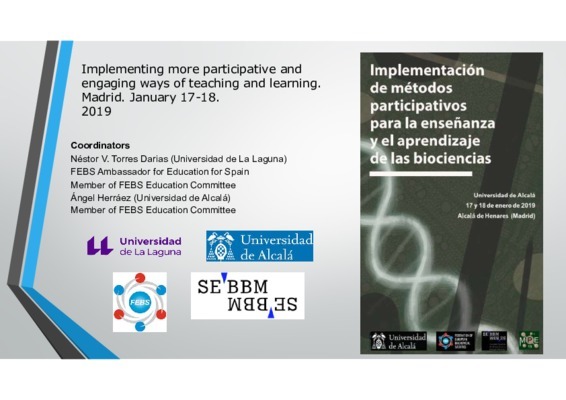 However, as a professor of biochemistry and the Chair of FEBS Education Committee between 2008 and 2018, I had the opportunity to reflect on these topics, to collaborate with relevant bodies, and try to find the best solutions to educate the young generations and help them in their significant endeavour of shaping their future careers. I.1 Molecular life science is an extremely fast growing interdisciplinary field. The structure is complicated, including the integration of various domains of “hard-core science”, “applied science”, and “social science”. Growing challenges are awaiting the educators in molecular life sciences. Educators have to keep aware of the fast developing techniques. They have to adapt their teaching to the pace of the development in the field. In addition, the educational methods used also need to be finetuned to the necessity and expectations of the students. Scientific organizations such as FEBS, IUBMB, IUC, and others have structured “Education Committees” to guide in meeting these challenges. I.2 One main strategic challenge is that the European funding bodies attach importance to the funding of research and not so much to the funding of education. However, we need good educators to educate good scientists… We have to raise the awareness of this important concept among the funding European Bodies. FEBS Education Ambassadors’ Working Group, “Communication with the Relevant Stakeholders” has worked on a “letter” to share with the relevant bodies for exactly this purpose. Because it explains very well this perspective, I am sharing this letter which was sent to FEBS Constituent Societies on August 20th, 2018. The Lisbon Declaration in 2000 set the goal for Europe to become the most competitive region by 2010. Now, in 2018 the FEBS Education Committe together with the Ambassadors on Education (from 33 different European countries) requests the support of the FEBS Constituent Societies to promote a campaign, together with the involvement of other FEBS Committees, and Working Groups, as well as other European and/or international scientific societies to focus on the competitiveness goal, set in 2000 during the next EU election campaign in 2019. Even the most contemporary research infrastructure or institutional system cannot be operated without the next generations of talented and motivated professionals. We are deeply convinced that excellent science teachers at all levels are essential to identify, motivate and fully support career follow-up of our future colleagues. The EU should promote both in member and candidate countries the legislation for a better social and financial recognition of those willingness to serve the future of European life sciences research. Support for innovative education techniques, development of advanced learning materials, deeper inclusion of research into curricula should get the proper priority in the next EU budget planning as well. Networking in the form of education workshops, advanced courses, e-communication techniques should be strengthened. In addition to the mobility grants set to help less affluent countries to send their talented youngsters abroad, a reverse grant system should be established for those willing to return to their home countries and initiate advanced research and education in molecular life sciences and in other areas on natural sciences there. This initiative will also favor networking and expand the diversity of foreign collaborations. 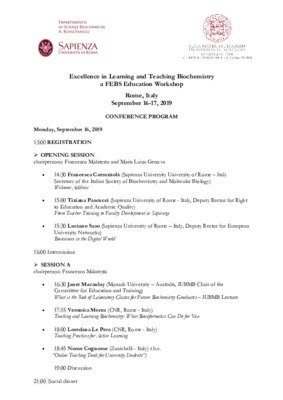 The FEBS Education Committee together with the network of FEBS Constituent Societies, is willing to support this initiative to make Europe really the most competitve region leading in innovative science education in the future. If your Society would like to support this initiative, which we highly appreciate, please kindly let us know what type of activity you are planning. We do hope to have a favorable outcome. I.4 The job opportunities for the molecular life scientists have changed during the last few decades. The percentage of PhD holders who work in academia has drastically diminished . For example in Germany, only 4% PhD holders in molecular life sciences presently work as professors in academia. The situation is similar in the UK. I believe that we all agree that holders of diplomas in molecular life sciences should have the capacity to carry our their careers within or outside their home countries, not only to increase career opportunities, but also to profit from what a different research/laboratory could offer. This necessitates “Preparing for the international space”. More and more universities all over the World are enhancing their projects and tools for “internationalization”. In the second part of this article, we will explore the different motifs for this initiative and methods on how to achieve this mission. Internationalization is the process of integrating international and intercultural dimensions into the teaching and learning, research, and global engagement functions of the universities. It is “preparing students for an international space”. It is, preparing “global-ready” students. In practice a variety of approaches to internationalization exist, at both the macro and meso levels: These approaches reflect or characterize “the values, priorities, and actions that are exhibited during the work towards implementing internationalization”. For example, some universities approach internationalization in terms of different types of activities, while others create a climate that promotes international and intercultural understanding (Knight, 2004). Hudzik and Stohl (2009) argue that internationalization needs to contribute to the basic vision and mission of an educational institution- “Internationalization is not an end in itself, but a means to reach the core goals of an institution, thus the outcomes of internationalization should be studied in relation to the missions and values of a particular institution”. Therefore, internationalization may be implemented in a variety of ways by particular institutions. In recent decades, internationalization within higher education has emerged as a distinct field for practice and research. However, there are few meta-analyses of how the research trends and foci of this topic have evolved and shifted over time. The article written by Bedenlier et al. analyses the content of the Journal of Studies in International Education (JSIE), a central journal for internationalization research, thus shedding light on overarching progress and trends within the field. In this investigation, the text-mining tool Leximancer™ is used to generate concept maps based on the titles and abstracts of all 406 scientific articles published in theJSIE between 1997 and 2016. Four major developmental lines in this research area are revealed: “delineation of the field” (1997-2001), “institutionalization and management of internationalization” (2002-2006), “consequences of internationalization: student needs and support structures” (2007-2011), and currently, “moving from the institutional to the transnational context of internationalization” (2012-2016). This article shows how the meaning of the concept has evolved to include several other related concepts in research on higher education, at the same time, reporting practices toward internationalization at individual, institutional, and national levels. With all the data obtained through various sources, strengths, weaknesses, opportunities and challenges were identified. As depicted below, ACE-CIGE composed a list of Student Learning Outcomes related with internationalization in three different categories: Knowledge, skills, and attitudes. Understands his culture within a global and comparative context (that is, the student recognizes that his culture is one of many diverse cultures and that alternate perceptions and behaviors may be based in cultural differences). Demonstrates knowledge of global issues, processes, trends, and systems (that is, economic and political interdependency among nations, environmental-cultural interaction, global governance bodies, and nongovernmental organizations). Demonstrates knowledge of other cultures (including beliefs, values, perspectives, practices, and products). Uses knowledge of diverse cultural frames of reference, alternate perspectives to think critically/solve problems. Communicates and connects with people in other language communities in a range of settings for a variety of purposes, developing skills in each of the four modalities: speaking (productive), listening (receptive), reading (receptive), and writing (productive). Uses foreign language skills and/or knowledge of other cultures to extend his access to information, experiences, and understanding. Appreciates other cultures (language, art, material culture, politics, religion, and philosophy of different nations). Accepts cultural differences and tolerates cultural ambiguity. Demonstrates an ongoing willingness to engage, to seek out international or intercultural opportunities. Euroepan Universities Association (EUA) has made doctoral education one if its priorities. The title of a European project conducted by EUA (2015, supported by the European Commission’s Erasmus Mundus Programme) was “Principles for International Doctoral Education”. “Internationalisation is of central importance to doctoral education, and should be a key priority for universities. As defined in the Salzburg Recommendations, internationalisation is a significant component of developing the quality of research and of doctoral education within universities. At the same time, international experiences are critical to the professional development of many doctoral candidates regardless of their discipline and subsequent career paths. Universities should therefore approach the internationalisation of doctoral education in a coherent, strategic manner. The FRINDOC project has aimed to facilitate institutional development in the internationalisation of doctoral education. It provides a framework for universities to define and implement strategies as well as an online tool for self-evaluation (frindoctool.eua.be)”. Four universities were key players in this project: Imperial College London, UK; Stellenbosch University, South Africa; University of Bergen, Norway; University of Camerino, Italy and the University of Hong Kong, China. The author’s university at that time, Dokuz Eylül University in Izmir, Turkey was one of the second circle universities which contributed with their data to this Project. Universities must provide access to good research environments with appropriate supervision and resources. Universities must be engaged in international activities at the institutional level, through the work of both supervisors and doctoral candidates. Universities must have sufficient institutional structures to manage, administer and develop the internationalisation of doctoral education. Universities must facilitate mobility for both doctoral candidates and staff. 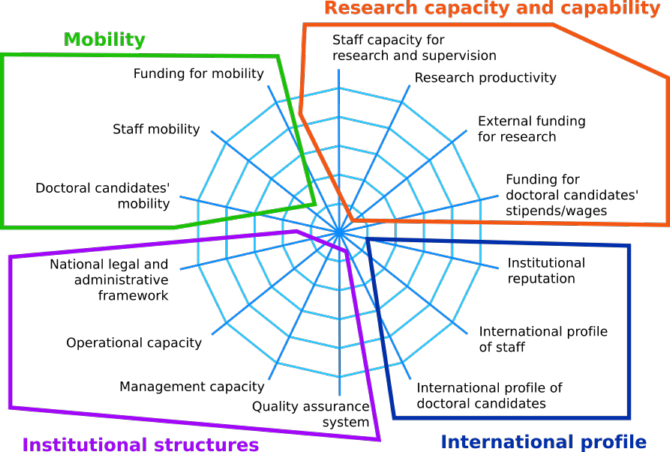 Following these principles, good practices in international doctoral education can be seen in four dimensions (See Figure 2): (1) International profile, (2) institutional structures, (3) research capacity and capability, and (4) mobility. Internationalization is one of the most important challenges in higher education. It is indispensable for the education of individuals competent in coping with the demands of the modern world. It gives the individual an advantage which will support him in his career opportunities. Higher education institutions should deal with this component of education in a professional way. It should be kept in mind that quality assurance is an important theme in this endeavour. 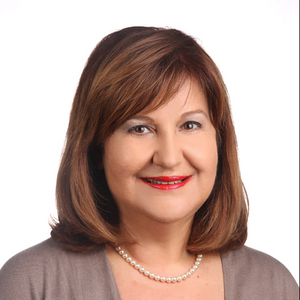 Professor of Medical Biochemistry, Department of Biochemistry, School of Medicine, and Director of Graduate School of Health Sciences; Izmir University of Economics; Izmir, Turkey. Internationalization in higher education: past and future. International Higher Education 95, 1-4. Mapping internationalization on US campuses. American Council on Education, Washington, DC. This article is part of a Dossier on University Education first published, in Spanish, in the March 2019 issue of the SEBBM Journal.